En attendant... un petit aperçu ça vous tente??? supe !!!!! je vais m'inspirer !!!! 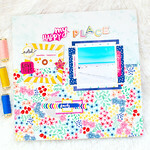 I would like to ask you, where did you get in American Crafts patterned paper and alphabeth stickers, you used on layout 'A new life' in die scrapperin - digital? Could you offer for me an French online shop (with shipping to Hungary), where I can buy these items? ?